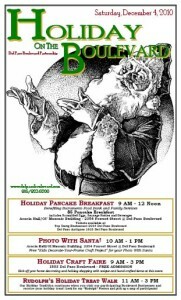 The Del Paso Boulevard Partnership is hosting the Holiday on the Boulevard event tomorrow. Holiday on the Boulevard takes place throughout the day with a holiday pancake breakfast, photos with Santa, a holiday craft faire, and Rudolph’s Holiday Treat Walk. The Pancake Breakfast take place at Acacia Hall/Ol’ Masonic Building. The $5 Pancake Breakfast includes Scrambled Eggs, Sausage Patties and Beverages, and proceeds benefit Sacramento Food Bank and Family Services. The breakfast runs from 9am – 12pm noon. Tickets available at Top Dog Restaurant and Del Paso Antiques. Photos with Santa are scheduled from 10am – 1pm at Acacia Hall/Ol’ Masonic Building, and the holiday craft faire is scheduled from 9am – 3pm at 1803 Del Paso Boulevard. Rudolph’s Holiday Treat Walk takes place from 11am – 3pm.